David Brooks should have left well enough alone. Middle-class wage stagnation is the biggest economic fact driving American politics. Over the past many years, so the common argument goes, capitalism has developed structural flaws. Economic gains are not being shared fairly with the middle class. 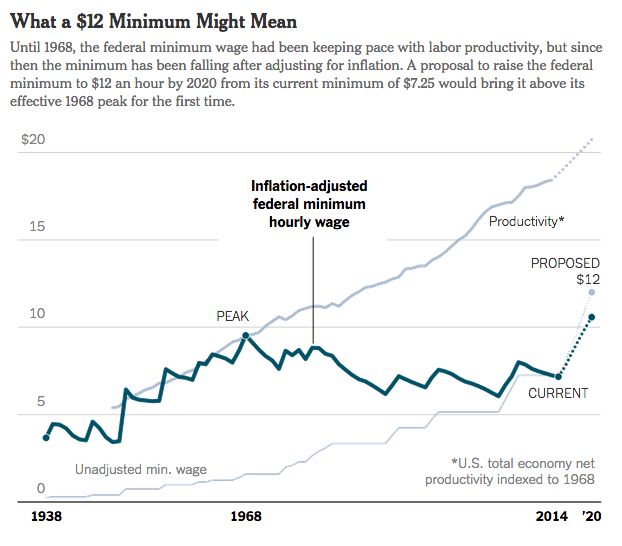 Wages have become decoupled from productivity. 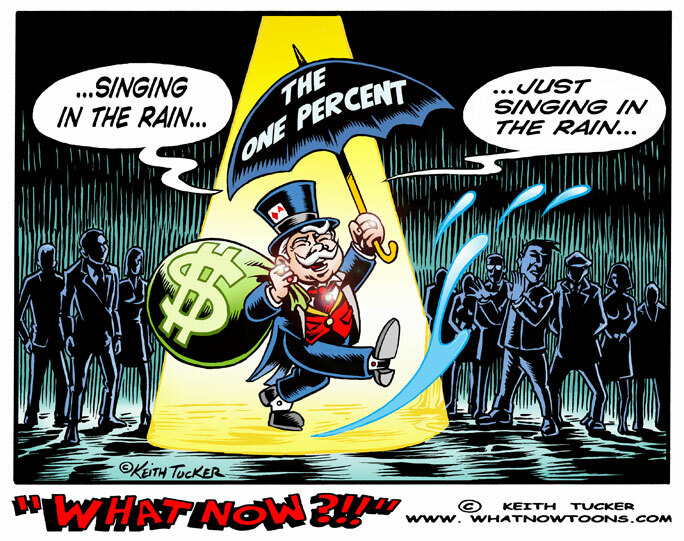 Even when the economy grows, everything goes to the rich. Well, maybe it’s working “more or less as it’s supposed to” for those at the top. But it’s certainly not working for everyone else, for those who actually have to work for a living. 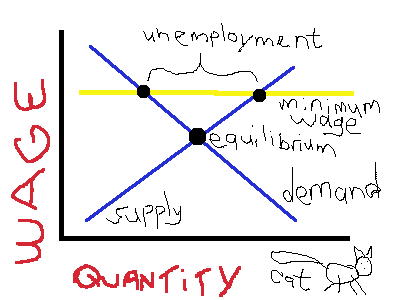 The relevant debate is all about wages and productivity. It’s not that a rising tide doesn’t lift all boats; it’s that the tide is not rising fast enough. Except, of course, productivity has grown—and wages haven’t kept up. Not by a long shot! 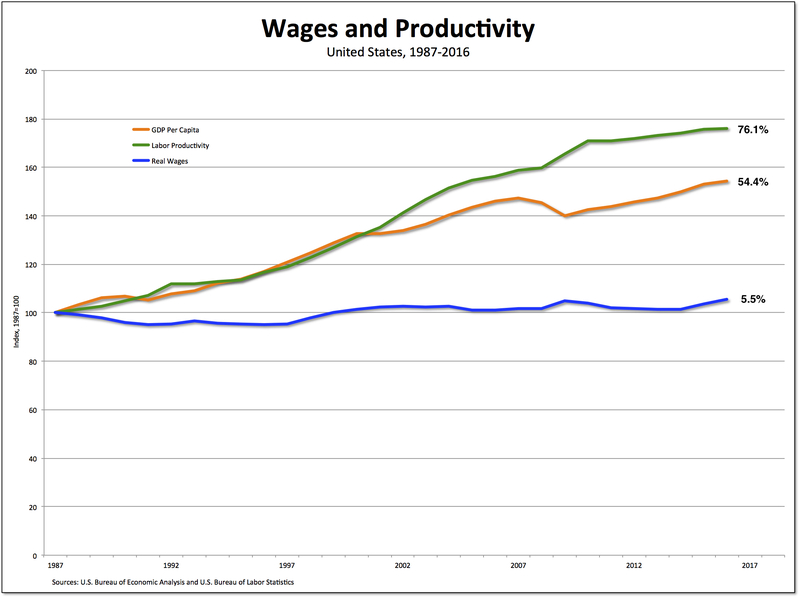 As is clear from the chart above, productivity has increased enormously since 1987—whether measured in terms of real GDP per capita (the orange line) or, even more, real nonfarm business output per hour worked (the green line). So, yes, Americans have become more productive over the course of the past three decades. But wages have lagged far behind. In fact, as is also clear in the chart, real wages (measured in terms of real weekly earnings, the blue line) have been virtually stagnant. They’ve risen only 5.5 percent over that period, much less than GDP per capita (54.4 percent) and labor productivity in nonfarm businesses (76.1 percent). In the end, maybe Brooks is right. Maybe the growing gap between wages and productivity is not a structural flaw. Maybe it’s the way the market is supposed to work. If so, then it’s time the break the system that both generates and relies on the large and growing gap between wages and productivity—the one Brooks and mainstream economists work so hard to convince us isn’t broken at all. Our job, then, is to get to work imagining and creating a radically different economic and social system. I was thinking about the idea of communism as a horizon as I read (only because a reader [ht: ja] sent me the link) the latest from New York Times columnist David Brooks. He begins by noting that, in the eighteenth century, American Indians rejected colonial society (which “was richer and more advanced”) but many whites were moving the other way, choosing to live within Indian society (which was “more communal”). Brooks then moves up to the present and notes that there seems to be a new desire for community, at least among Millenials. Maybe we’re on the cusp of some great cracking. Instead of just paying lip service to community while living for autonomy, I get the sense a lot of people are actually about to make the break and immerse themselves in demanding local community movements. It wouldn’t surprise me if the big change in the coming decades were this: an end to the apotheosis of freedom; more people making the modern equivalent of the Native American leap. There are cleaning teams, cooking teams, security teams, language lessons, art classes, children’s activities, beach outings, translators, Arabic lessons for volunteers and more. Squats are run without government or major nongovernmental-organization influence and rely on donations and manpower from independent volunteers. Responsibility is divided among the residents. At Dakdouk’s original squat, a “local technical group” is the go-to for all maintenance and IT issues. There are plans to establish a bakery to produce bread en masse for residents and rooftop gardens to provide “for the soul and for the body,” says one group member. I doubt anyone thought that was how communism would come to be established—among refugees, the most marginalized people in the world today. However, that may be exactly the communist horizon both Badiou and Brooks have in mind: noncapitalist communal activities that provide for both the soul and the body. *Interested readers should consult the pioneering work of Jack Amariglio (e.g., “Subjectivity, Class, and Marx’s “Forms of the Commune’,” Rethinking Marxism, 22:3, 329-344) and Dean Saitta (e.g., “Marxism, Prehistory, and Primitive Communism,” Rethinking Marxism 1:1, 145-168). The vow taken by compassionate conservative columnists appears to be “to have and to hold from this day forward”—unless you actually try to make a connection between inequality and poverty. First up was David Brooks. Now we have Robert Samuelson. No, we don’t need any miracles. As Brazil has shown, all you really need to do is give poor people enough money to end their poverty. Not so hard. But, of course, that’s not enough—because it still leaves in place an economic system that continues to generate enormous misery at the bottom, which is both a condition and consequence of concentrating incomes at the very top. As it turns out, the real fear on the part of the Brooks’s and Samuelsons of the world is that people will stop believing in miracles, actually make the link between poverty and inequality, and then demand an alternative set of economic arrangements—an inclusive, democratic economy that doesn’t generate either the obscene amount of poverty or the grotesque levels of inequality we see today. There’s no need then to punish the rich. Just take a vow that, “for richer, for poorer,” we need to imagine and create a different kind of economy. Since I started this blog, I’ve read a lot of economic analysis and political commentary, much of it inane. But, I figure, it’s one of the services I can provide. Why should everyone have to work their way through that stuff when I can do it for them? 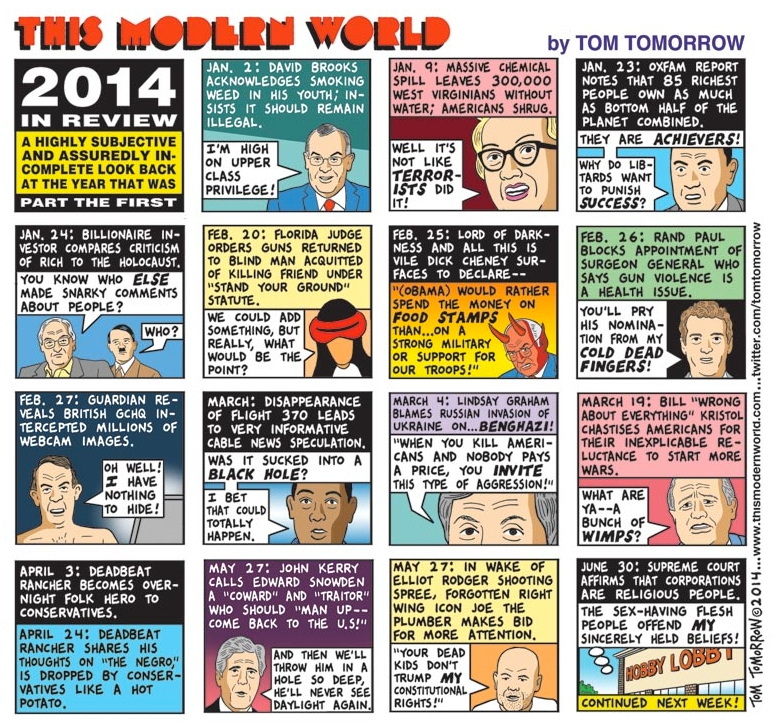 But you have to draw the line somewhere and, years back, I drew it at David Brooks. Talk about inane! And then a friend comes along and sends me something I should take a look at. And so I did. It’s a review by David Brooks [ht: bn] of George Packer’s latest, The Unwinding: An Inner History of the New America. Thanks to Brooks, I’m actually going to go out and purchase Packer’s book. However, the review is interesting for a very different reason: Brooks actually waxes nostalgic for Marxism. I wish Packer had married his remarkable narrative skills to more evidence and research, instead of just relying on narrative alone. Combine data to lives as they are actually lived. When John Dos Passos wrote the “U.S.A.” trilogy, the left had Marxism. It had a rigorous intellectual structure that provided an undergirding theory of society — how social change happens, which forces matter and which don’t, how society works and who causes it not to work. Dos Passos’ literary approach could rely on that structure, fleshing it out with story and prose. The left no longer has Marxism or any other coherent intellectual structure. Packer’s work has no rigorous foundation to rely on, no ideology to give it organization and shape. But the lack of a foundational theory of history undermines the explanatory power of “The Unwinding,” just as it undermines the power and effectiveness of modern politics more generally. Much to my surprise, I actually find myself in agreement with Brooks. The Left, such as it is today, doesn’t really have an intellectual structure that one might call Marxism. 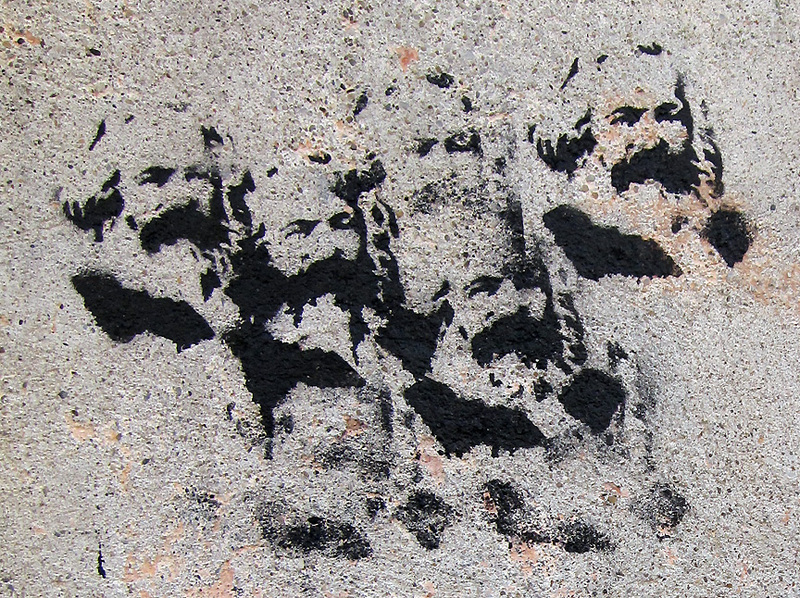 There is, of course, a lot of Marxism out there—the traditional kind Dos Passos relied on in the 1920s and 1930s as well as a radically new kind of Marxism, of the sort one will find in and around the journal Rethinking Marxism. And, it’s true, many radical thinkers and activists today, in the midst of the Second Great Depression, are rediscovering the usefulness of Marxist ideas. But there’s still a big gap, at least in the United States, between Marxism and left-wing ideas and political activities—and a lot of work that remains to be done to bring them together. But, David Brooks, if it’s Marxism you want, to give “organization and shape” to the critique of the great unwinding that is contemporary America, well, let’s do it. We have a whole world to win.